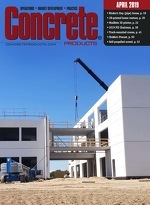 One of the top independent ready mixed concrete operators has leaped to the forefront of a revolution in heavy duty truck and fuel specs, announcing a projected eight-year migration from diesel to compressed natural gas power in its 500 mixer and support vehicle fleet, plus an extension of its CNG supply infrastructure to a commercial fueling station. Six months after installing a compressor to serve an initial group of 30 CNG-powered mixer trucks, Ozinga Brothers has added the station for fleet customers running light- to heavy-duty CNG vehicles. Built at the Pilsen plant—bordering downtown Chicago and near interchanges with principal transportation arteries—it is the city’s first such facility under private operation. “Through alternative energy investments like Ozinga’s, Chicago has become a leader in the new energy economy and is better equipped for a more efficient, cleaner and sustainable transportation system,” said Chicago Department of Transportation Commissioner Gabe Klein. Ozinga Brothers launched the CNG fueling venture under Ozinga Energy, with target customers including public and private delivery, utility and refuse fleet operators. In addition to pump and nozzle installations, the business has required establishment of fleet account management plus federal, state and local tax collection facilities comparable to a diesel and gasoline station. Tax rates are calculated by a gasoline gallon equivalent factor, as CNG engines are spark ignited. For internal accounting and fleet procurement planning, Ozinga Brothers has applied a diesel gallon equivalent variable, determining that CNG can offer $1.50–$3.00/gallon savings against conventional fuel. The producer took delivery of its first 14 CNG-powered mixers in late 2011, ordering 16 more this year; all are McNeilus Ngen models mounted on Kenworth W900S models with Cummins Westport ISL-G (8.9L) power and Allison 4500RDS automatic transmissions. Most of the trucks have been based at the Pilsen plant, primarily serving projects in Chicago city limits. Two mixers are slotted for the suburban headquarters plant, in Mokena, Ill., where a small-scale compressor and fueling equipment are being installed. In tandem with the fleet-wide conversion of rear and front discharge mixers from diesel to CNG power—through new vehicle purchases between 2013 until the end of the decade—Ozinga Brothers plans more fueling stations for its suburban Chicago and northern Indiana ready mixed operations.